Traveling to Ladakh by Road is one of the most exciting road adventures in India. There are two ways of reaching Ladakh by road. One is via Manali and another is via Srinagar. Both the routes offer you an incredible experience and the most interesting is to go via Manali and return via Kargil to Srinagar if you have enough time and do not mind covering long drive which although tiring but a rewarding experience. Road trips to Ladakh are filled with colourful monasteries, narrow roads with steep curves; the most scenic snow topped Himalayan range and Karakoram mountain ranges, and many other surreal spots. Apart from offering such stunning views of surroundings, these trips also challenge you physically and mentally through the rugged terrains and slightly unpredictable climatic conditions. The route from Kashmir Valley via Kargil is approx. 434 Km, which remains open for traffic from early June to November. The 473 km Manali-Leh road has been serving as the second overland approach to Ladakh, which remains open for traffic from around mid-June to early October. Delhi to Leh by car – Delhi to Leh Ladakh by car is considered as an adventure. Travel to Leh Ladakh from Delhi by road. The road trip to Leh by SUV or motorcycle is a lifetime adventure experience for travellers. The total travel time is approximately 24 hours and the distance from Delhi to Leh via Leh Manali Highway is around 1011 Km. For road trip enthusiasts who want to go to Ladakh from Delhi, it is better to go via Manali because Manali is just a day’s drive from Delhi but also gives you a day more in your itinerary! It goes without saying that the 490 km Manali-Leh highway gives an adrenalin rush to anyone who takes it; with sharp turns and bends along the stretch. The 40-45 km road stretch that crosses more plains between Lachung La and Tanglang La! Besides, passing through Gata Loops is bound to test your driving skills! From 4,198 meters the Gata Loops incline you to 4,664 meters within a distance of a mere 13 kms! At this juncture, we must know that the roads undergo a lot of wear and tear through the year due to landslides, torrential rain and heavy-duty snowfall. Thanks to the Border Roads Organization (BRO) that keeps them in good shape so that when the route is opened for all, you have a safe ride all along. From the lush green forests, picturesque villages, snow-clad mountains, intimidating deep chasms, meandering Chandra Bhaga river at Jispa; wall of snow at least 8 to 10 feet high along the road-side at Rohtang La and Barlach La to the barren Moore Plains where there’s not a blade of grass in sight and the marvelous Gatta Loop, you will be witness to some of the most captivating views. We bet you will not want to close your eyes even for a second because it is a blink-and-you-miss landscape! Manali-Leh route has no match because you drive through a diverse terrain, especially the high altitude motorable passes like Rohtang La, Barlach La, Nakila, Nachung and the third highest motorable pass in the world – Tanglang La, which is 17,582 feet above sea level. You reach Tanglang La after crossing the picture-perfect Moore Plains. It is recommended that you don’t stay here long because of low oxygen levels. Otherwise, you may suffer from Acute Mountain Sickness. Khardung La pass at 17,582 feet is only 39 km from Leh and people drive this distance to tick it off their bucket list! Besides, the icing on cake is Chang La, which is the highest motorable pass at 17,586 feet above sea level. It lies on your way to the Pangong Tso Lake which is visited by many even when Chag La is buried in snow in winters. The only time that is considered best for travelling on Manali – Leh Highway is June to September. If travelling by road, a person will take at least two days with adequate stops for rest. If you would like to see snow on the passes the good time to start is mid of June, experience bone chilling cold and ride on rough patches. By July-August, snow on the mountain tops is less; the temperature is bearable. August to September, the conditions of the roads are almost perfect in shape with all the slush dried out, with no sudden weather changes, maintenance work almost completed on these roads by BRO but your eyes will be devoid of view of snow on the way. 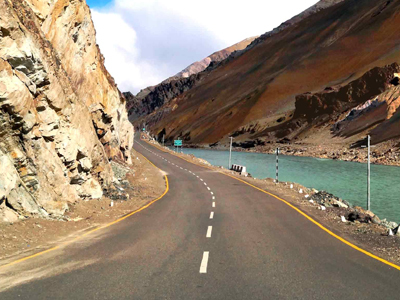 The Srinagar-Leh highway provides a gradual ascent, helping the body to acclimatize properly to the altitude of Leh and in fighting any chances of AMS (Acute Mountain Sickness). Srinagar to Leh can easily be done in 2 days, starting from Srinagar on first day, night halt at either Drass or Kargil and reach Leh by the evening of second day. 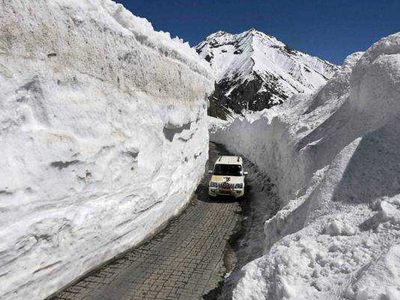 The Srinagar -Leh highway that is snowbound for over 5 months is usually operational from May to October; this is a smooth highway, Kargil, with a few rough patches. The way from Srinagar to Zanskar takes you from the pleasant Dal Lake to the grassy pastures of Sonemarg to the treacherous Zozila Pass to the Kargil town, finally after passing by glistening rivers, myriad hues and contours of landscape, never ending grasslands, barren mountains, frozen peaks, numerous dirt tracks, you have entered Zanskar-a land forgotten and lost in a time warp. If you can survive dirt tracks, landslides, and treacherous terrain, well pat yourself on making your way through heaven-though it is not exactly a glide. The lifeline of Srinagar-the picturesque never ending Dal Lake which stretches on and on. Dotted with innumerable houseboats and floating shops, the Dal is like balm to a roving traveler spirit. Highly recommended is staying in one of the houseboats, and savoring Kashmiri hospitality. Sonemarg valley is one of the most beautiful places on this highway. The drive from Srinagar to Sonemarg is itself a scenic one meandering through golden fields and towering hills. The meadows are inviting for a trek or a pony ride through the gentle terrain. Rangdum is a town lost in time warp. A town of merely a dozen houses or so with the Rangum Gompa dotting the landscape and being the focal point, this is one enigmatic place on the way to Padum. Surrounded by lofty mountains and sprawling grasslands, Rangdum is a place to feel one with nature and yourself. Everywhere you look, you will be enamored by its vastness, quietude, and solace. Padum is the district capital of Zanskar-a sleepy hamlet which comes to life only for six months of the year when the snow has melted. It is base camp for trekking further in Zanskar region and sightseeing the numerous monasteries dotting it. Karsha monastery is the largest Gompa in Zanskar region. Perched high atop a mountain, the climb to the monastery is one which will leave you breathless. But once you have made it, equally breathtaking are the views from the monastery of the sprawling plains of Zanskar. If that’s not enough, break humble bread with the monks and enlightenment won’t be far long. All the above places en-route will make this journey memorable for you.